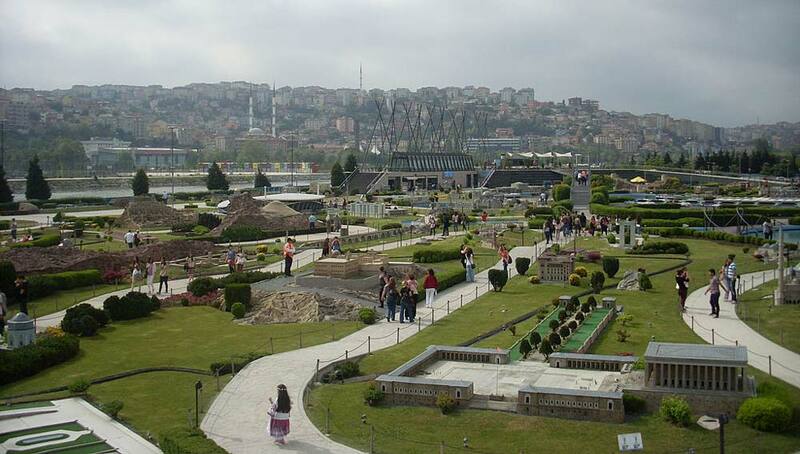 Miniatürk is a wonderful miniature park that is situated on the Golden Horn in Istanbul. It opened in May, 2003. It covers more than six hundred thousand square feet. It is one of the largest miniature parks in the world because its model area is over one hundred thousand square feet. The park has many waterways and pools, along with a parking lot that can hold five hundred vehicles. This park has 122 models that were made in 1/25th scale. 58 of them are structures from Istanbul, 52 are from Anatolia, and 12 come from the Ottoman areas that lie outside of Turkey. The park features many historic structures such as the Temple of Artemis, and also the Mausoleum of Maussollos in Halicarnassus. Extra space has been reserved for future models. The models were created in thirteen workshops, ten were located in Turkey. The Circulating Capital Enterprises and Dokuz Eylul Universities contributed substantial amounts to the creation of the models for Miniatürk. Models were made with industrial strength plastic materials. This means that they will have the ability to withstand all kinds of different weather elements. Prior to being put on public display, the models have to pass a final test that is done in the Miniaturk Test Area. The park has many icons of several different civilizations and cultures. Models cover the Hagia Sophia, Selimiye, the Rumeli Fortress, Galata Tower, Safranbolu Houses, Qubbat As-Sakhrah and Mount Nemrut. Also included are works that no longer exist such as the Artemis Temple, Halicarnassus Mausoleum and also the Ajyad Castle. The park has three main sections which are the Istanbul, Anatolia and former Ottoman territories. These sections are divided from each other by small, unique landscape designs. Using the general design of Miniaturk, the area has been decorated with dwarf plants, bonsai trees and fine grass. The Miniatürk has a four hundred seat amphitheater, a playground, a gift shop, restaurant, cafe, labyrinth and even a life-size chess board.